A RHYTHM OF DAILY PRAYER is just that - an opportunity to craft a daily rhythm to our prayer lives. It is something we see clearly modelled in Scripture. Daniel prayed three times a day, for example (Daniel 6:10). The psalmist makes mention of the same principle (Psalm 55:17). We know that Jesus prayed early in the morning, during the day, sometimes all night. The point is simple – we can either try to fit prayer into our day, or we can build our day around times of prayer. A rhythm of daily prayer helps to establish a framework for this to become a meaningful reality, keeping us mindful of the Lord's presence with us throughout the day. Below is a Rhythm of Daily Prayer that you are free to download. It is modelled on the one used at Ffald-y-Brenin. My heart’s cry is that it will be an instrument that the Lord will use to lead you into His blessing and that it will enable you to walk in step with the Holy Spirit through the day, infusing the whole of your day with the knowledge of His Presence, allowing Him both to speak to, and with, you as you journey through the day. Although liturgy has been used, it is simply to provide a trellis (or framework) upon which you can build your time of prayer. There is lots of space for the Holy Spirit to break in and minister, so be receptive to His still, small voice. 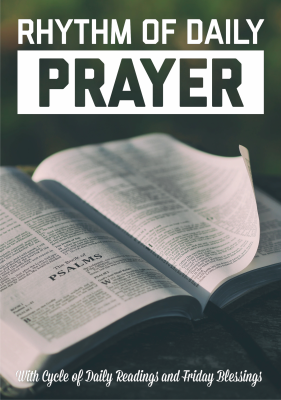 It is not a script to be religiously followed, but a simple tool to help introduce a regular rhythm to your prayer life as a means of building your day around prayer rather than trying to fit prayer into your day. Each Morning and Evening Prayer time is accompanied by a Bible reading, with the first reading forming part of the Morning Prayer and the second reading as part of Evening Prayer. This will enable you to read through the entire New Testament and Proverbs twice a year, and through the book of Psalms once. Of course, you may feel that the Lord is leading you to read a different portion of Scripture on any given day. That is fine. Feel free to be open to His leading. I would, however, encourage you to read the Scripture portion aloud, and slowly, reflecting on what you are reading and inviting the Lord to speak and minister to you. This draws on an ancient method of Bible reading called ‘Lectio Divina’, or ‘Divine Reading.’ It is a helpful, interactive method that acknowledges that God’s word is living and active, and that He wants to speak to us through it and invite a response to what He is saying. You may also want to keep a journal, taking a moment during (or after) your prayer time to record what you feel the Lord has revealed to you or prompted you to do. You will also note that some of the text is in normal font while some is in bold-type. If you are doing this as part of a group, have one person lead, reading the text in normal type, with the group responding by reading the text in bold-type. Read slowly, thoughtfully and prayerfully. Friday mornings provide an opportunity to speak blessings over your local community and over those you meet. Here is an example of a daily rhythm of prayer. Feel free to adapt it to suit your circumstances. Be blessed!